Convert scanned drawings and raster images to HPGL, DXF, WMF, and EMF vector. 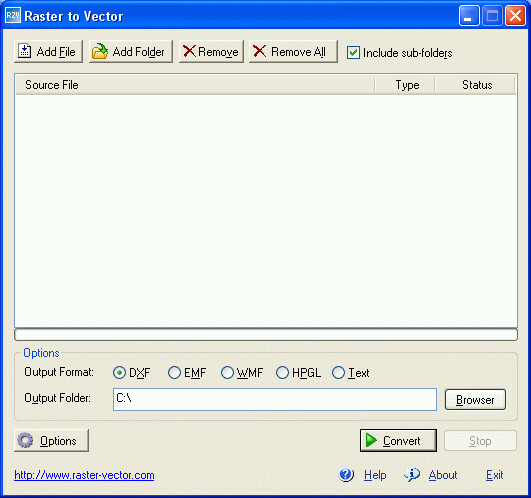 Developer: Raster to Vector, Inc.
Raster to Vector Advanced 7.1 is converters & optimizers software developed by Raster to Vector, Inc.. This graphic apps software is shareware, which means you can download and use Raster to Vector Advanced 7.1 for free during the trial period (usually for 30 days). At the expiration of the period you will have to buy the converters & optimizers product for $99.00. Raster to Vector Advanced 7.1 is available at regnow and Raster to Vector, Inc. website. Raster to Vector Advanced 7.1 supports different languages (including English). It works with Windows 98/XP/Vista. We have tested Raster to Vector Advanced 7.1 for spyware and adware modules. The software is absolutely safe to install. Our website has thoroughly tested graphic apps product Raster to Vector Advanced 7.1, written the review and uploaded installation file (546K) to our fast server. Downloading Raster to Vector Advanced 7.1 will take several seconds if you use fast ADSL connection. Convert scanned drawings and raster images to DXF, HPGL, WMF, and EMF vector. Convert raster images and scanned drawings to HPGL, DXF, WMF, and EMF vector. Vectorizer and vector graphics enhancement software. Creates fine lines.